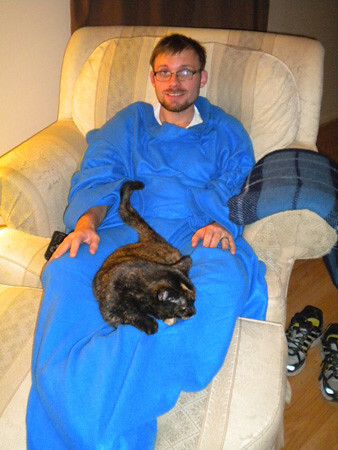 Nothing quite says holidays like the Snuggie. Chloe gave this to the husband for Christmas. I think it’s safe to say they’re both enjoying it. He looks awesome! 🙂 Andy got me an ECU snuggie for Christmas! Did you get one too, Jaime? Hilarious! Hope you guys had a wonderful Christmas. Maybe things will calm down for a bit now! How cute! I love my snuggie as well!